Response to Warren Ellis' and Simone Bianchi latest tale is nothing short of "astonishing." Marvel is pleased to announce that Astonishing X-Men #25 has sold out at Diamond and to satisfy everyone's craving for everyone's favorite mutants, Marvel is going back to press with Astonishing X-Men #25 Second Printing Variant. This new printing features an all new cover from the talented Simone Bianchi! X-Fans everywhere agree, that this issue is a must have! Timothy Callahan of Comicbookresources.com exclaims "...this is Bianchi's best American work so far... X-Men have rarely looked better!" and "Ellis and Bianchi are more than up to the task of making this one of Marvel's premiere books." Jesse Scheeden of IGN.com says "Ellis wastes no time showing off his skill for characterization and dialogue." 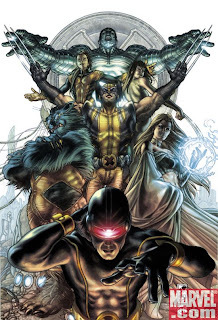 JustComics.Com exclaimed, "It's a new beginning for the X-Men. The artwork is stunning. The distinctive dialog is witty and character-defining... This comic WILL impress you." Marvel urges retailers to check their orders on Astonishing X-Men as the series continues to astound readers. With a new home, a fresh new base and complimented with some familiar faces, this book is sure to keep readers on the edge of their seats. Be sure to keep up with all of the nonstop action in Astonishing X-Men! Please note that Astonishing X-Men #25 may still be available at the retail level. Marvel Comics is a division of Marvel Entertainment, Inc., a leading global character-based entertainment company that has developed and owns a library of more than 5,000 characters, which have entertained generations around the world for over 60 years. Marvel's operations are focused in entertainment and consumer product licensing and comic book publishing. Marvel Studios supports the development of feature films, DVD/video products and TV series. Marvel's creative team also supports the development of video games and toy lines based on its characters as well as for a broad and growing range of consumer products and services including apparel, collectibles, foods and promotions. Marvel's comic book division is a leading publisher in the global marketplace while also serving as an invaluable source of intellectual property. Marvel's Toy Biz division is a recognized creative force and leader in toy design, sales and marketing, developing and overseeing both licensee and in-house toy lines. For additional information visit .